Ever thought about making your own spring rolls? And then quickly changed your mind when you realized you have no desire (or skill) to deal with the tricky wrappers? Allow me to introduce you to the spring roll bowl. 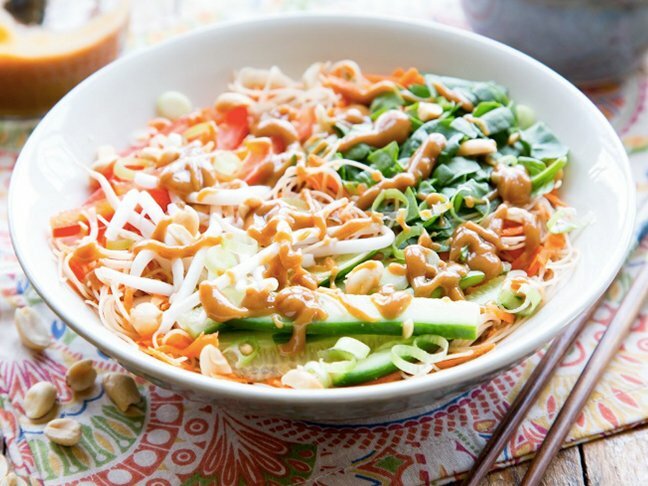 Each spring roll bowl is loaded with super thin rice noodles, your favorite crunchy veggies and topped with the most deliciously creamy (and addictive) peanut butter dressing. Best of all, you don’t have to worry about the paper and mastering that perfect roll. 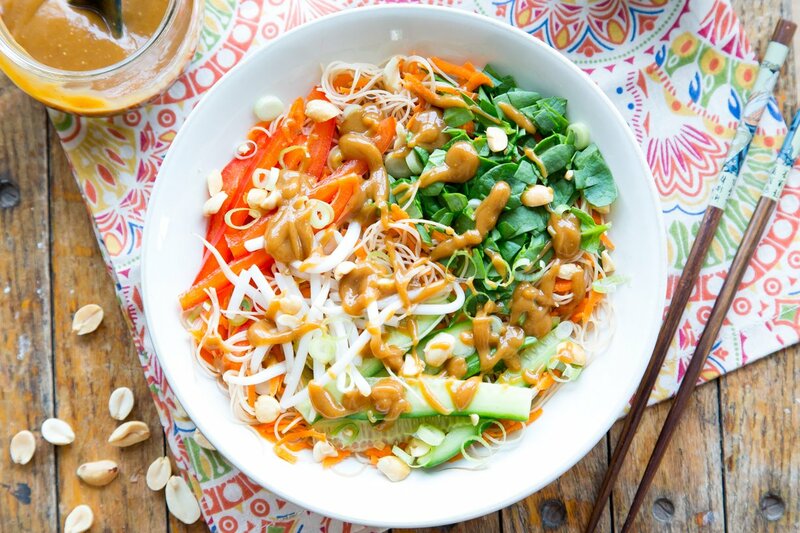 This spring roll bowl recipe is endlessly adaptable; you can add whichever crunchy veggies you already have on hand (clean out that veggie drawer!) or add in shredded chicken, or shrimp for added protein and to turn it into a more satisfying meal. Plus, there’s a spring roll bowl to fit every eating plan, from Paleo and grain-free to vegetarian to raw. You can’t get a more adaptable meal than that. Looking for an easy weeknight meal? This veggie spring roll bowl recipe is the answer to your dinner prayers. Step 1: In a bowl whisk the peanut butter, lime juice, soy sauce, rice vinegar, sesame oil and agave (or honey) until a creamy dressing forms. Set aside. Step 2: Cook the rice noodles according to package instructions. 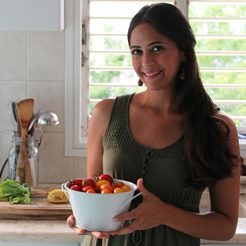 Drain and set aside in a medium-sized bowl. Fold the grated carrots into the noodles. Distribute the noodle-carrot mixture evenly between 4 bowls. Step 3: Top each noodle bowl with the prepared julienned pepper, cucumber, chopped spinach and sprouts. 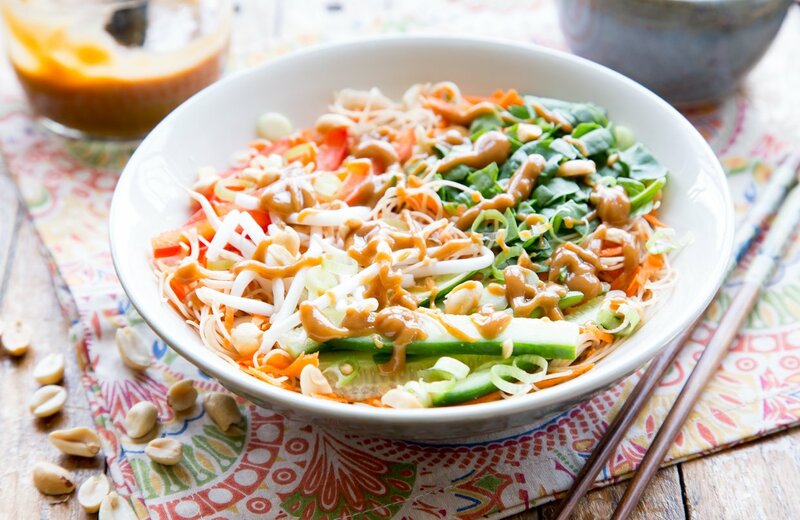 Sprinkle the top of each bowl with scallion slices and crushed peanuts. Serve with prepared peanut butter dressing.